I have no way to put this gently – this movie bites. It’s bad. It’s awful. It has not one single redeeming quality that bears its viewing. Watch it sober, watch it drunk – it won’t be good. The acting is bad, the script is bad, and the action is worse. 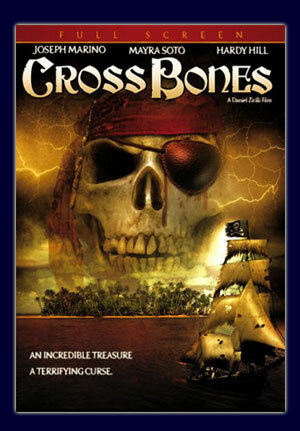 It just might be the worst pirate movie ever. Not “Plan 9 from Outer Space” goofy bad, just bad. Still want to know the plot? OK, a bunch of “Survivor” style contestants run around an island and get killed by a cursed pirate. Now go and rent something, anything, else. This was bad. Really bad. But it was also amusing, which makes it kind of good. Jolly Roger features all the typical elements of most teeny-bopper straight-to-video slasher flicks in the vein of such classics as “Leprechaun in the Hood” and “Jack Frost 2: Revenge of the Mutant Killer Snowman” – a supernatural villian in search of his treasure kills many people along the way, some of whom get naked first. And while the costume of Jolly Roger himself is actually quite impressive, not much else is. 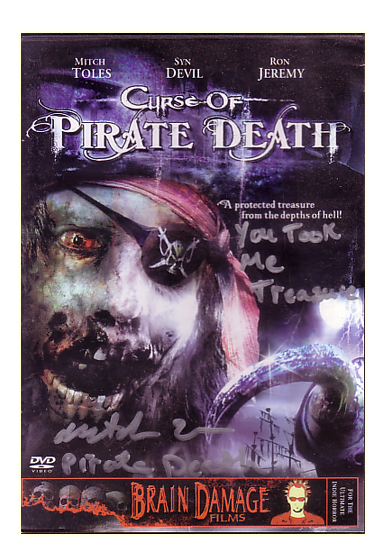 Unbelievably, the best scene in the whole movie, in which Jolly Roger has a heart-to-heart while sharing rum with a bartender, got edited out – you can view it in the “deleted scenes” segment of the DVD. Jolly Roger is bad. But watch it anyways. If you’re old enough to drink, watch it drunk. If you’re not, well, wait until you’re 21, and then watch it drunk.